While the jockeying for positions in the top half of the ladder takes place, of particular interest will also be the battle for places in the bottom half of the eight – particularly whether Carlton can conjure a miracle and avoid its fifth wooden spoon since the turn of the century. As always, I will provide this analysis in two parts: in Part I, I analysed the current top eight and their hopes of either staying alive in the race for the double chance, or holding onto their place in the eight. Here, I will look at the teams currently outside the top eight and any chances they have of making a late finals charge, and in the case of Carlton, whether they can climb off the bottom of the ladder. We start with North Melbourne, who are currently just outside the eight. 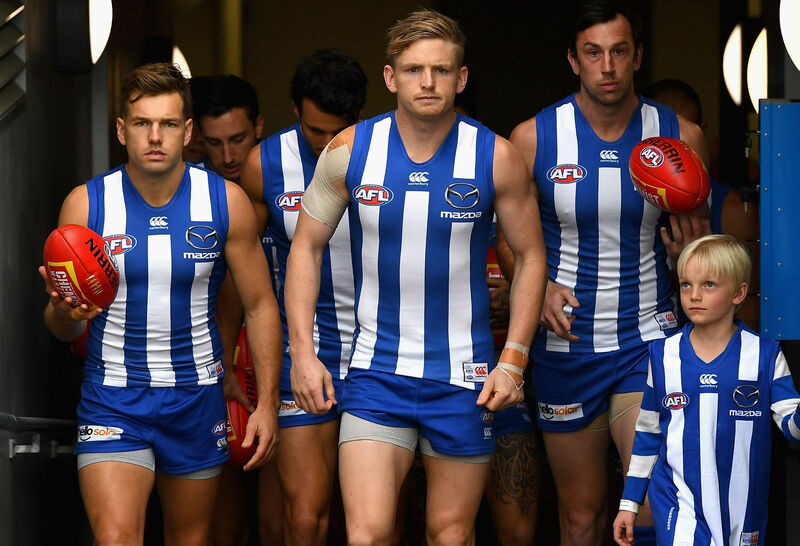 Despite being tipped by many to take out the wooden spoon at the start of the season, North Melbourne have shown that they are a side not to be taken lightly in 2018. Of their seven remaining matches, four of them are at Etihad Stadium, while they also have a home game against the West Coast Eagles in Hobart, which they have developed into a fortress in recent years, winning 13 of their 17 matches since cracking the market in 2012. This Sunday is the fourth of five consecutive matches Brad Scott’s men are playing at Docklands, and it comes against a Sydney Swans side which has been seriously ravaged by injuries to key players in recent weeks. While they will brace themselves for the possibility that Buddy Franklin will kick his 900th career goal at some point this weekend, they’ll otherwise be feeling confident of their chances after pulling off a two-point victory in the sides’ last meeting, at the SCG back in Round 7. 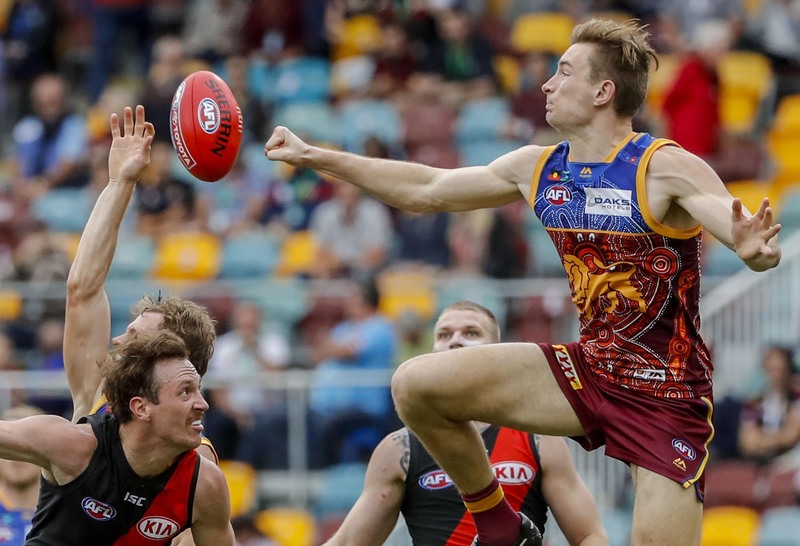 Two road trips are also scheduled, for Brisbane and Adelaide where they will face the Lions and Crows in rounds 20 and 22 respectively, before they finish off with a winnable game against St Kilda in the final round. Four wins from their final seven should be enough for them to break into the eight, and I have them qualifying for the finals at the expense of Melbourne (who are currently sixth but I have finishing ninth). Matches to play: Richmond (Spotless), Port Adelaide (Oval), St Kilda (Spotless), Carlton (Etihad), Adelaide Crows (UNSW), Sydney Swans (Spotless), Melbourne (MCG). Inaccurate kicking from the Giants proved to be their downfall in their 11-point loss to the West Coast Eagles in Perth last weekend. That result has tipped them out of the eight with seven rounds to play, but after a fortnight from hell during which they lost their twin towers Jeremy Cameron and Jonathan Patton to long-term suspension and injury respectively, there could be some respite to come as early as this week. It was reported that Brett Deledio and Toby Greene trained strongly in recent weeks, putting them both in the frame to face defending premiers Richmond at home this Saturday night. The match against the Tigers, in what will be their first meeting since last year’s preliminary final, is one of several tough clashes the Giants will face in the run home. They also have to face Port Adelaide away, as well as the Adelaide Crows in Canberra and the Sydney Swans at home before it could all come down to a possible finals play-off against Melbourne at the MCG. Cameron is due back from his five-match suspension against Carlton in Round 20, and his return, as well as the impending ones of Deledio and Greene, will boost the club’s finals chances significantly. While the Giants will do all they can to remain in finals contention, I think the task will prove too much. 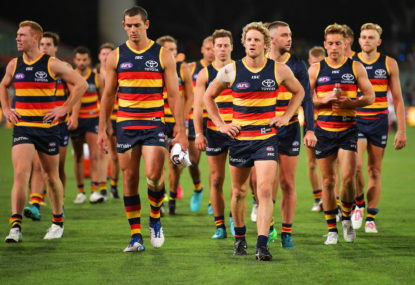 The last rites may have all been delivered on the Adelaide Crows’ season following their 47-point loss to Richmond at the MCG last Friday night. Not only did the result dent their finals chances significantly, the gap between them and eighth-placed Hawthorn increased to eight points, while their percentage also dropped to 94.2. 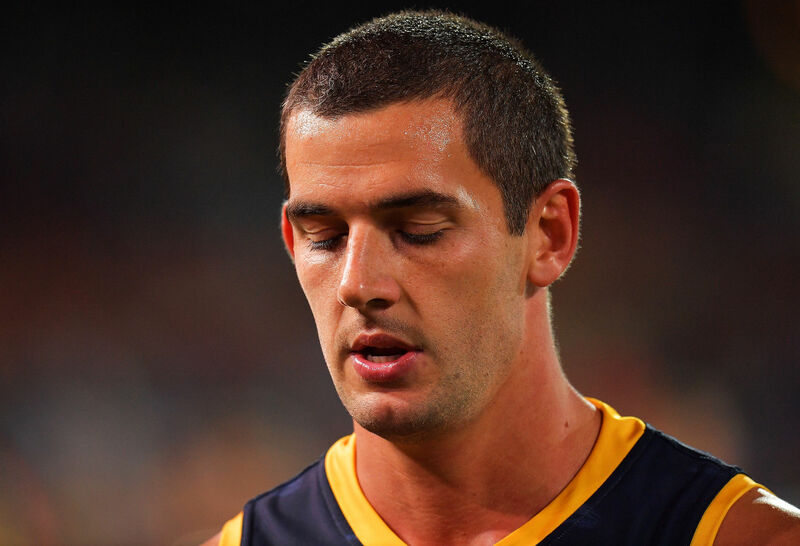 Injuries to captain Taylor Walker, Rory Sloane and Brad Crouch, among others, have contributed to their slide from having the AFL’s deadliest attack to the point where they have struggled to score heavily in recent matches. Their clash against the Cats is essentially their last chance to remain in the finals hunt, though they do have winnable matches against the Brisbane Lions and Carlton, both away from home, in the run to September. Other than that, they also have to face Melbourne, Port Adelaide and GWS, three teams still in with a chance of reaching the finals, with the Round 21 clash against the Giants, who will have Jeremy Cameron back from his five-match suspension, to be held in Canberra. Ultimately, their tough run home will conspire against them and twelve months after reaching the grand final, and embarrassing themselves on the big stage, a quiet September could loom at West Lakes. 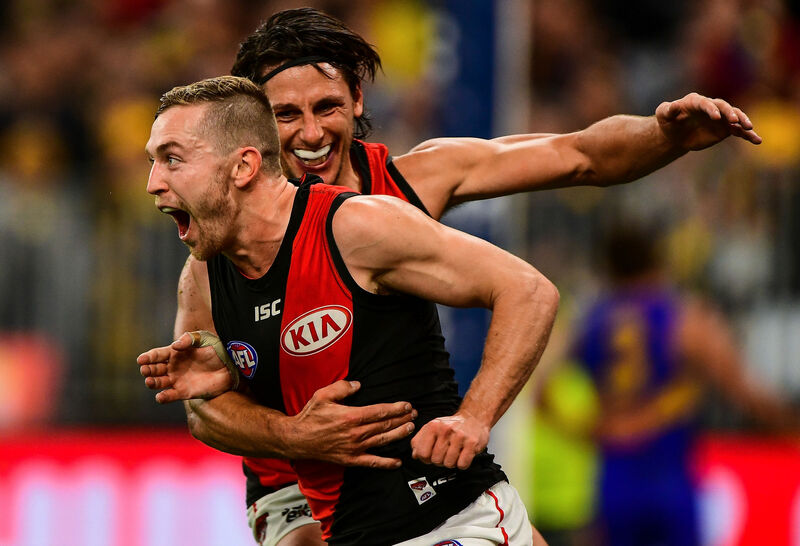 Just when everything was starting to come together for Essendon, suddenly last week’s controversial loss to Collingwood has set them back in their bid to reach finals in back-to-back years for the first time since 2003-04. The 16-point loss to the Pies has left them in 12th position on the ladder with a dismal percentage of 94.2, which should get a boost when they face the Gold Coast Suns, Fremantle and St Kilda within the next month. They will also fancy their chances of beating the injury-hit Sydney Swans for the first time in nearly seven years when they host them at Etihad Stadium for the first time since 2014, in Round 9. Other than that, they must also face Hawthorn, Richmond and Port Adelaide – each for a second time in the season – in the run to September. The Bombers’ final chance to crack back into the eight could come down to the match against the Tigers, who won by 71 points the last time the two clubs met, in the Dreamtime at the G clash in round eleven. While they should remain competitive in the run to September, their poor percentage and a 13-point loss to Carlton in Round 8 will come back to bite them, and I see no change to their current position on the ladder. With a very tough run home, it will remain to be seen whether Fremantle can remain competitive in the final seven rounds of the season. Despite this, they only have to travel twice in this period, and also get a run of three straight games in Perth including the away Derby against the West Coast Eagles in Round 20. They will fancy their chances against Port Adelaide this weekend, having not lost against them at home since 2014, but that is then followed by a six-day break before they fly east to face Essendon at Etihad Stadium. 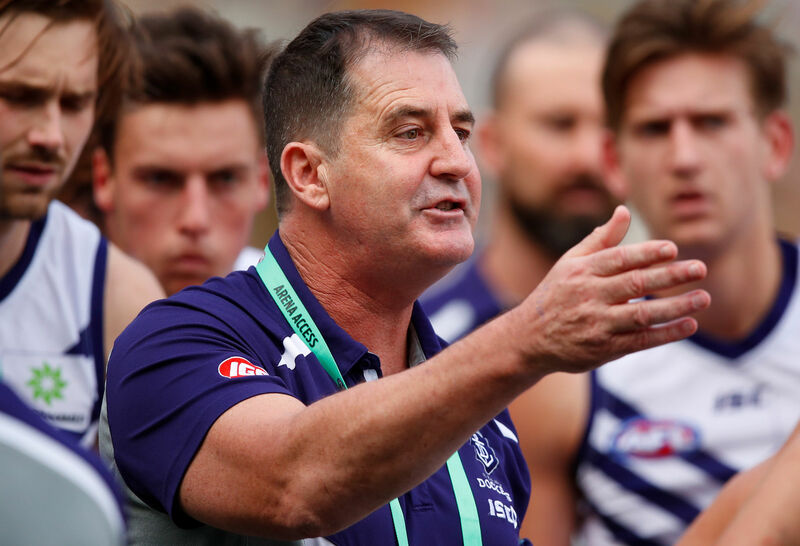 Ross Lyon’s men must also contend with facing bogey team Hawthorn (who they’ve only beaten twice since 2007) at home, while a tough road trip to the Cattery awaits in the penultimate round before they wrap up proceedings with a huge home game against Collingwood. With finals all but out of reach, Lyon has turned his focus on giving his younger players more game time, with Danyle Pearce and Michael Johnson both being told they are not required at the club in 2019. It will now remain to be seen how the Dockers play out the season, and like Essendon above them, I don’t see them making any movement on the ladder by the end of Round 23. Further down the ladder, the Western Bulldogs’ fall from grace appears like continuing, with the 2016 premiers set to become the first team since the Adelaide Crows in 1998-2000 to miss two consecutive finals series after winning a flag. Injuries to key players, including captain Easton Wood, who will almost certainly not play again this season due to a hamstring injury, have not helped their plight, with Luke Beveridge’s men crashing to 14th place on the ladder with just five wins from fifteen outings so far. To state the obvious, six of their final seven matches are against sides well above them on the ladder, with only the match against Carlton in Round 22 a certainty in which they will start favourites. They only have to make only one flight out of Melbourne in that period, flying over the Nullarbor to face the West Coast Eagles at Optus Stadium in Round 18, while they will have MCG engagements against Melbourne this Saturday night, and Richmond in the final round. I only have them winning one of their final seven matches, and it’s – yes, you guessed it – against Carlton in Round 22. 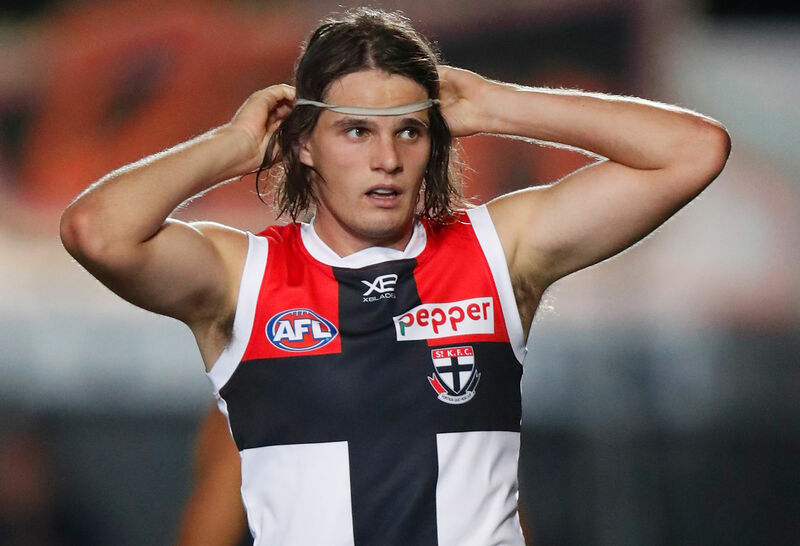 If the St Kilda Football Club had been able to perform to expectations this season, then their final seven rounds could have been the dream run their fans could have asked for. Why? Because six of their final seven matches in what has been a season from hell are at Etihad Stadium, of which two are winnable, while the other match will see them make the short flight north to face the GWS Giants at Spotless Stadium. Even though the Giants will be without Jeremy Cameron (who will serve the final week of his five-match suspension in Round 19) and Jonathan Patton, facing them in Sydney will still be a tough proposition for the Saints, who kicked three goals in the final quarter to force a 73-all draw in Round 5. But while they can’t make the eight, they can at least shape it, or knock opponents out of the race, when they face Essendon, Hawthorn and North Melbourne, all at Docklands, in the final three rounds. A win or two in that period would be a much-needed boost to the club and whatever chances they have of doing well in 2019. In the end, I have them remaining where they are – 15th. Although 2018 has been another long year for the Brisbane Lions at the foot of the ladder, their fans will be pleased to know that the club has made significant strides on and off the field. They’ve won their last two matches, and have an average winning margin of 58.66 points – quite amazingly one of the best in the competition for a side sitting in 16th place on the ladder. Making their past fortnight all the more impressive is the fact they were missing one of the best defenders in the competition in Harris Andrews, whose immediate playing future remains uncertain after was knocked out by a crude elbow from Jeremy Cameron in Round 14. 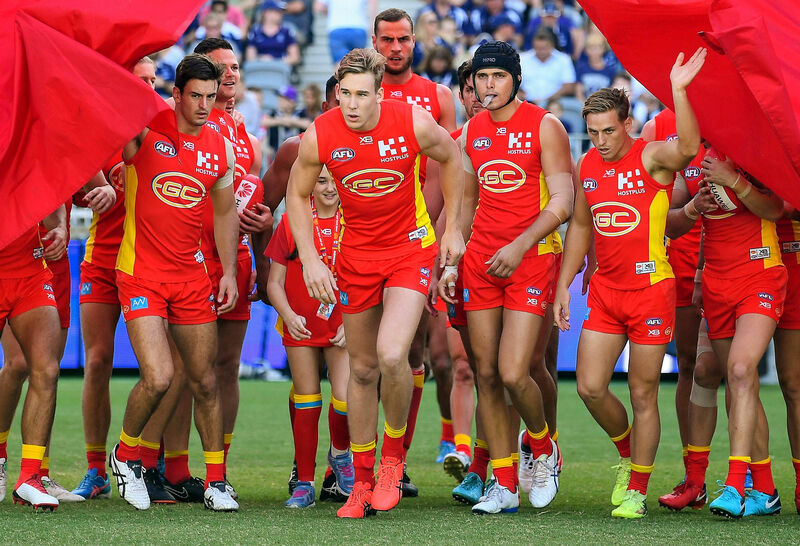 Apart from starting favourites against the Gold Coast Suns in Round 22, they’ll also be eyeing off some late-season upsets as their opponents scramble for places in the top eight. The toughest match of the lot is against Collingwood in what will be their first clash at Etihad Stadium since 2002, when the Lions were in the midst of their premiership dominance. While they have the chance to snare some more wins before the season is out, I have them also remaining where they are – in 16th place on the ladder but in a good position to climb the ladder in the years to come. If coach Stuart Dew’s first season in charge of the Gold Coast Suns wasn’t tough enough already, then it could get even more tougher in the final few rounds as they fight to avoid another bottom two finish. The Suns are winless since starting the season with three wins and two losses, and that streak looks like continuing for at least another fortnight with a home match against Essendon and a visit to Sydney to face the Swans lined up in that period. However, they will get the chance to break their long losing streak when they host Carlton in Round 19, before another horrid four-match stretch to finish the season which includes hosting reigning premiers Richmond in Round 21. They then have a home derby against the Brisbane Lions before they wrap up another season from hell with a visit to Kardinia Park in the final round, where they have lost two matches by a combined total of 270 points, including a record 150-point defeat in 2011. The future of co-captain Tom Lynch continues to be a major talking point, with speculation he will leave the club at season’s end to return to Melbourne where either Collingwood or Hawthorn are most likely to snare his services. He is currently sidelined for the rest of the season due to a knee injury and it’s all but likely he has played his last game for the struggling club, which has yet to play finals since it entered the AFL in 2011. And judging by their current plight, it does not look like that drought will end anytime soon. I have them winning against Carlton in Round 19, and it should all but be enough for the club to finish well clear of the Blues in the battle for the wooden spoon. All Carlton fans would want is for this season to be over already. After losing Bryce Gibbs and Sam Docherty during the off-season, the former a trade to the Adelaide Crows and the latter to a serious knee injury, the Blues are in the midst of their worst ever season which could see them pick up their fifth wooden spoon since the turn of this century. 2018 is so far turning out to be the most challenging season in coach Brendon Bolton’s time at the club, though officials continue to believe that he is indeed the right man to turn their fortunes around. So far the club has only been able to pick up one win, against bitter rivals Essendon in Round 8, but it could prove to be a significant result in the context of the season should the Bombers miss the eight. They have otherwise been uncompetitive in most matches, and the spotlight has without doubt been on the club during the week after their humiliating 65-point loss to the Brisbane Lions at the Gabba last weekend. 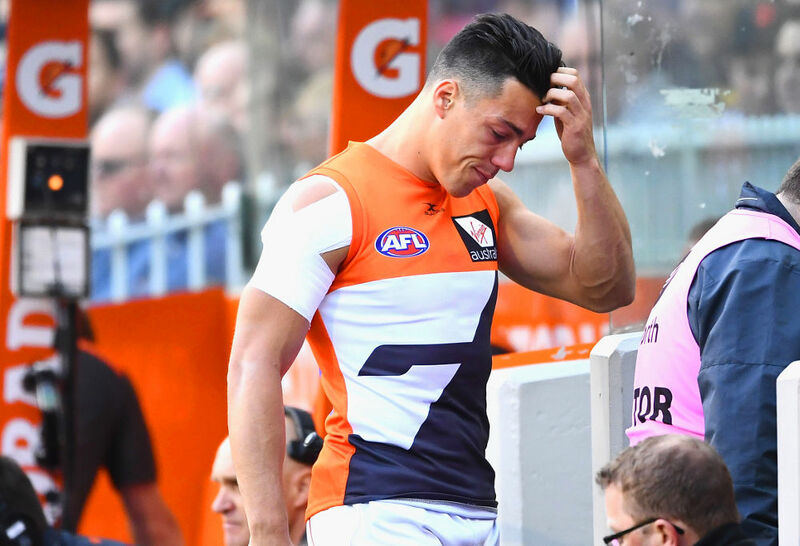 The season from hell is expected to continue with trips to the Gold Coast and Perth lined up, while they will be unfortunate to face a GWS Giants side whose full-forward Jeremy Cameron will be fired up, scheduled to return from his five-match suspension against the Blues in Round 20. The clash against the Suns in Round 19 could shape as the last chance the club has of avoiding the wooden spoon, as a loss will all but certainly see them take out the kitchenware for season 2018. Other than that, I can’t see the Blues winning any more matches for the year, and not only will it be their worst season ever statistically, it would also be the worst season by a non-expansion club since Sydney won just one match in 1993, and worst by a Victorian club since Fitzroy also won just once in 1996.